All Power Labs is an incubator of open-source technology for gasification and pyrolysis. APL manufactures and distributes a Biochar Experimenter’s Kit (BEK) and a Gasifier Experimenter’s Kit (GEK), offered in several versions ranging from a package of cut sheet steel parts ready for welding to completely assembled units with full instrumentation. True to their open-source claims, All Power Labs also makes the CAD (Computer Aided Design) files for the parts available for free downloading. The company is housed at an artist work space called “the Shipyard” in an industrial area of Berkeley, California, and borrows its open source philosophy from the culture of information technology. Using 21st century desktop manufacturing technologies like a computer guided plasma cutter, they perform what company founder Jim Mason calls “DIY power hacking.” Computer modeling of combustion processes remains such a complex problem, Mason said, that it is faster and easier to just cut new parts out of metal and try them in fast build and test cycles. The design advances quickly because all the information is open source, and anyone can participate and offer improvements. People can be authors of their own power systems similar to the way that desktop publishing and the Internet created the information revolution. An important part of the open source design process is a series of workshops that All Power Labs hosts on a quarterly basis for a nominal fee. These workshops offer GEK and BEK owners and others an education on the theory and design principles of gasification and pyrolysis along with hands-on experience assembling and testing the machinery. The basic technology to gasify wood was developed during WWII by individuals who wanted to keep driving in the face of gasoline rationing, but it was always a finicky process, dependent on the time-consuming preparation of fuel into dry, one inch cubes of wood. 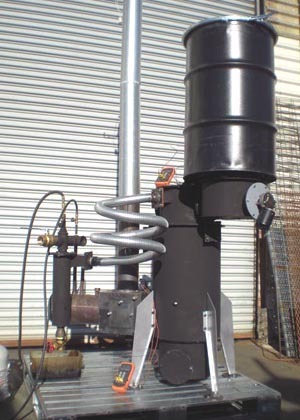 All Power Labs has made a series of improvements to produce a downdraft gasifier that can now run on common woodchips. One of the important advances to achieve this is a system for recovering waste heat and using it to help dry and pyrolyze the fuel. Although power generation was the first objective for Jim Mason, he has been interested in biochar from the start, as char is a natural byproduct of gasification. One year ago, APL began offering the BEK-Biochar Experimenters Kit which is a collection of the basic GEK components reconfigured to optimize biochar production. APL has sold about a dozen BEK units so far, mostly to academic research teams that need to make different kinds of biochar for testing in soil. The BEK components can be assembled to produce biochar using several different processes, including three different gasifer modes as well as both an indirectly heated retort and a sweep gas heat transfer mode. Heating ramp rates and residence time at specific temperatures can all be controlled while multiple instrument ports provide temperature profile and other data. An important objective for the BEK was clean operation – it lights with propane to burn off early pyrolysis gas, self-supports on pyrolysis gas once running, and uses propane again at shut down to prevent smoke formation. It must be stressed that even customers who purchase a BEK fully assembled are still getting an “experimenter’s kit.” At a recent APL workshop in October, it took a lot of time to adjust and troubleshoot the BEK to produce two kinds of biochar. 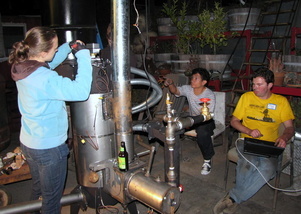 But, as one biochar researcher pointed out, the BEK provides a big head start compared to building a test bench biochar maker from scratch. And the $4995 price tag for the ready to assemble kit is a bargain compared to available laboratory grade pyrolysis equipment. BEK Unit; photo courtesy of Kelpie Wilson.